One year ago we were about to have a baby and my productivity outlook for 2012 looked pretty bleak. The first two months after our daughter was born were kind of a blur and I got very little done. The one thing I did make time for was a course called Make Sh*t Happen from master motivator Jenny Blake. I went through the lessons at all hours of the night – if I was up with our crying baby I’d login and make some headway with the little bundle of tears on my lap. Fortunately our daughter eventually outgrew her insane middle of the night crying fits and I started finding time to puruse the path I’d set in Jenny’s course. The concept behind Make Sh*t Happen is that you pick one really big goal you want to accomplish and the course walks you through overcoming the obstacles that have been keeping you from your goal. It’s easy to get distracted, particularly when you’re unsure of your course or you’re avoiding something you don’t want to do. Even if the task is something basic. For example, trying to get my kids ready for bed can be one of the most frustrating parts of my day. They only have a few small steps to get ready for bed but when they’re trying to avoid bedtime they can stretch that simple process into a lengthly series of distractions. You may have a few things you need to work on to move you towards your big goal but if you avoid those things like my kids avoid getting ready for bed you can turn a half day project into a 6 month delay. Maybe it’s something you’re unsure of or maybe it’s something you’ve done before and wish you didn’t have to do again (cough, income taxes). Whatever the reason, if those roadblocks are there then you can be easily distracted and sidetracked. You hate to admit it but you may be sabotaging your progress in order to avoid something you’re unsure of or worried about. We all suffer from some form of roadblock and Jenny helps address them in her Make Sh*t Happen course. She breaks your process of trying to make something big happen down into small steps and walks you through the necessary introspection and decision making steps. That approach fits my personality so I found the course to be a big help in clarifying and quantifying what I was working towards. I can’t give all the credit to Jenny but I did release my Only 9 Minutes project to beta testing at the end of 2012 and managed to squeeze in the majority of the Debt Heroes book as well. Jenny has some pretty good testimonials on her course info page so I’m not the only one who made progress thanks to her. 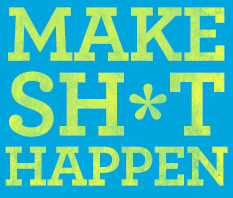 So if you have something major you’d like to tackle in 2013, I’d suggest checking out Jenny’s Make Sh*t Happen course to see if it can get you rolling. It’s probably not right for you if you don’t already have a specific goal in mind. Just feeling generally motivated to take action in the New Year isn’t a good enough reason to sign up. The people who went through the course with me were pretty motivated and knew what their big goal was, they just needed the course to help kick start their progress. The course would be a perfect fit for you if you’ve had a big goal or idea you’ve been sitting on for a while. If that’s you then I’d definitely recommend checking out what Make Sh*t Happen has to offer. It’s a 10 week online course and starts on Monday so if you’re tired of putting off your big idea get signed up before it closes.